Good morning! The sun is shining brightly in Michigan today. I hope it’s shining where you are. It’s sad/crazy how much sunshine affects us as humans. Tricia: When Rebecca asked me what I wanted to post about I picked reading. I’m still working on writing my first book so I don’t feel very confident talking about that yet. But reading? I’ve got that covered. I love it. I would marry my Kindle if I could. Lately I’ve been reading a lot of YA fantasy books because that is what I’m writing. I started reading fantasy when I was 14. 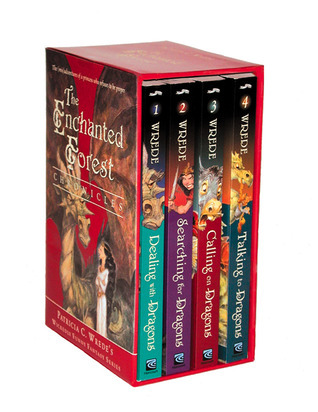 That was when I discovered one of my two favorite fantasy series: The Enchanted Forest Chronicles by Patricia C. Wrede. I love her books, so when I started writing I wondered why. What makes me love them? I think she has achieved my ideal balance of character development and a fast moving plot. I’m never bored when I read those books. The plot rarely stays in one place for long. Her main character, Cimorene, just speaks to me. I want to be her. Which, of course, as a new writer makes me ask, why? As a reader I think I tend to like the less flawed characters. It drives me crazy if the main character is constantly doing dumb things. I’m the person sitting by the pool or at the park yelling at my book, “You idiot! We can all see that’s a terrible idea!” So, yeah, don’t judge me when you see that. But, Patricia Wrede did a great job with Cimorene. She’s confident, smart and never an idiot. Yet still believable. That’s the hard part, right? 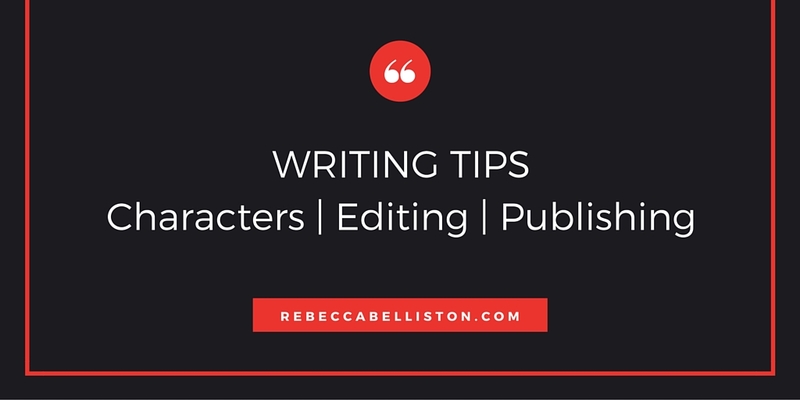 Making your readers feel like the character could really exist. My other favorite character by Wrede is Kim in the book “A Matter of Magic.” She is more flawed than Cimorene, but never an idiot. Kim is more like the heroine that I am trying to write in my book. She is just learning about herself and trying to figure out her place in the world. I love those stories. Haven’t we all had to find out who we are? Maybe most of us feel like we are still learning what our place is? I think characters that deal with that are the easiest for me to relate to. My second favorite thing to read is anything to do with history. Mostly American history, but I love all history. I don’t care if it’s historical fiction or non-fiction as long as it doesn’t feel like a textbook. I want a story that moves along. I’m not a patient reader. Well, I’m not a patient person in general, and I’m definitely not a patient reader. I want books that I can’t put down because I know there will be something exciting on the next page, something new that I just have to read. I have so many favorite historical books. I read “Little House on the Prairie” when I was 6 and I’ve never stopped learning about our past. 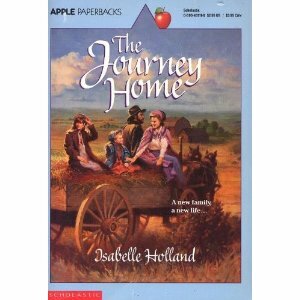 But the one I read the most is called “The Journey Home” by Isabelle Holland. It fascinated my young girl mind. It is the story of two sisters in the late 19th century. Their mother dies leaving them orphans. They decide to leave the orphanage in New York to ride the orphan train in hopes of finding a family. The emotions in that book are so real I felt like I was Maggie or Annie. I read that book over and over until it fell apart. Again it was the story of finding out who they are and where they belong. I guess that is what I love reading about the most. I love a story where the character finally finds a place where they feel like they are home. Whether it’s a physical location or a person who they belong with, I want them to feel that sense of belonging in the end. As a new writer I’d love to hear some feedback! These are the books that have defined my love of reading. I’m sure they will have an even bigger effect on my writing. Rebecca: I love Tricia’s points. Some of my favorite books have an MC who is unsure of who she/he is until life (plot) thrusts it out of them. There’s a lot of that in the Hunger Games. Katniss is just a girl trying to live her quiet life and stay alive. Yet life thrusts her center-stage (literally) and she’s forced to become a leader and symbol of an entire revolution. I love that she doesn’t expect it or necessarily even want it. I also love that she can’t even see her own strengths or leadership qualities. It makes her real. It makes the reader think, That could be me. Isn’t that what readers want? Isn’t that why we read? To take ourselves to another world, another reality, and think, That could be me. To do that, like Tricia said, characters need to be somewhat flawed and even a little insecure, because that allows us to relate. But not too flawed. And it can’t just be the MC either. 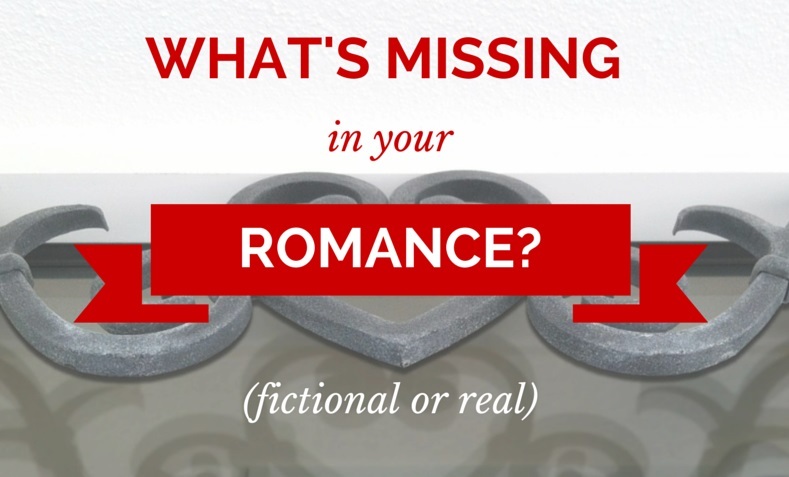 I’ve read several novels where the main character is flawed, but the love interest is THE PERFECT MAN. Always says the right thing, does the right thing, looks the right way. It’s starting to bug me. I think all characters need to make at least one mistake that affects the story line, because that’s life. Our mistakes sometimes take us to dark places, the same dark places that often allow us to grow the most. But I also agree with Tricia that having a character that is too flawed can be annoying, especially when they are just plain stupid and dense. Unless it’s What About Bob? where their out-of-touch-with-reality personality IS the plot. And then it’s just hilarious. I think the reason why authors are scared to give their characters flaws is we’re afraid readers won’t like our character. And they might not. It’s a big risk, isn’t it? I think that as readers, we are quite forgiving of characters as long as they learn something from their mistakes. In my novel, Sadie makes a huge, stupid, and dangerous choice to go back to an abusive boyfriend. I’ve had readers get really angry at her for this. But the reality is–and the reason why I allowed her to–is thousands of women go back to abusive men. I wanted to explore why. They have their reasons and Sadie had hers. Whether that crossed the line like Tricia mentioned and some readers were yelling besides their pools, I don’t know. :) But it was a risk I took and I wouldn’t change it. I’m hoping that even if the majority of my readers wouldn’t make the choice she did, they can at least sympathize with why she went back–and more than anything, learn from her mistake. She certainly did. So take risks. Let your characters make mistakes that real people make, not overly stupid ones. Even the gorgeous hunks (especially the gorgeous hunks). Okay. Enough rambling from me. Thank you SO much, Tricia!!! I adore you and am very excited to see more of your writing. What I’ve read so far is awesome!!! 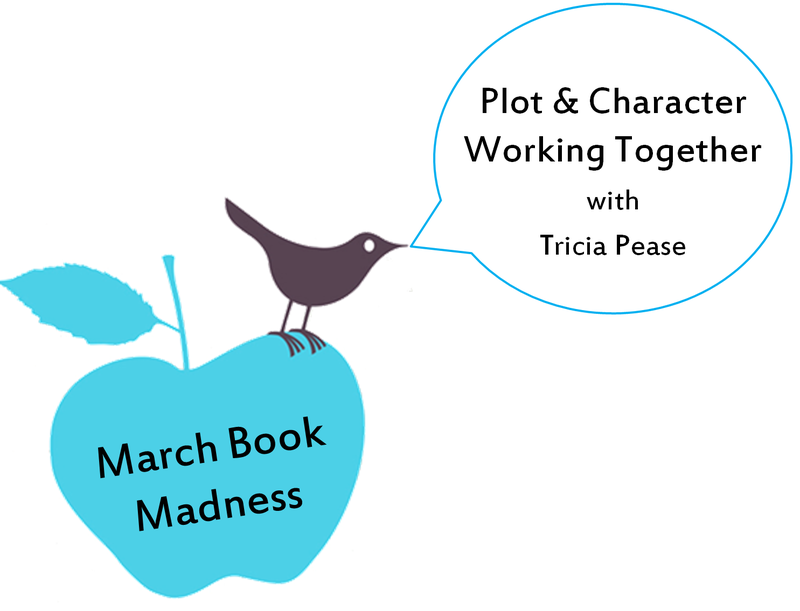 What feedback do you have for Tricia? As a new author, what can she be looking for as she reads? What do you look for? Do you take notes? Highlight books? What are your tricks? Who are your favorite characters? Why? 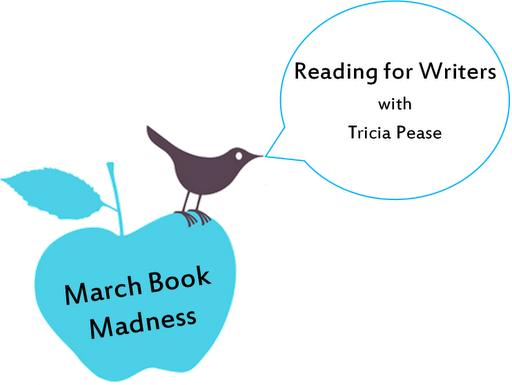 Check back Thursday when Sharon Belknap will be discussing more on this topic of reading as a writer. See you then!